As an advocate for indie business owners and as a business owner myself, I’ve always believed that there are two different types of businesses. The first type of business owner believes that when they put forth the effort to start a business, they deserve to have customers. This business will sometimes be successful from the start, but most times will wonder why they do not have customers–until it either clicks, or maybe it doesn’t. The second type of business owner never feels that their work is done and will work to earn their customers ALWAYS, regardless of the amount of customers they acquire over time. They will work themselves harder each day, forever. I strive to be the second type of business owner. Being an entrepreneur that not only works in the creative graphic design/art industry but also in marketing and social media marketing takes effort and a strong (constant) work ethic. I work as hard as possible for my clients and I feel appreciated by them so it is a consistent win-win scenario for me. My business has a couple sides. I spend countless hours working on art, zoomed in to the most selective details, creating well-balanced graphics that have to be aesthetically pleasing and intriguing, sometimes losing several hours inside artwork. Then suddenly I need to snap on my “business hat” which is the role in which I run my own professional meetings and consultations, invoice, create systems/presentations/pragmatic marketing strategy. I have been consistently working on training myself to switch effortlessly back and forth. I believe it comes from my natural thirst to learn, and learn a lot. That is why I decided to attend Social Media Marketing World this year. 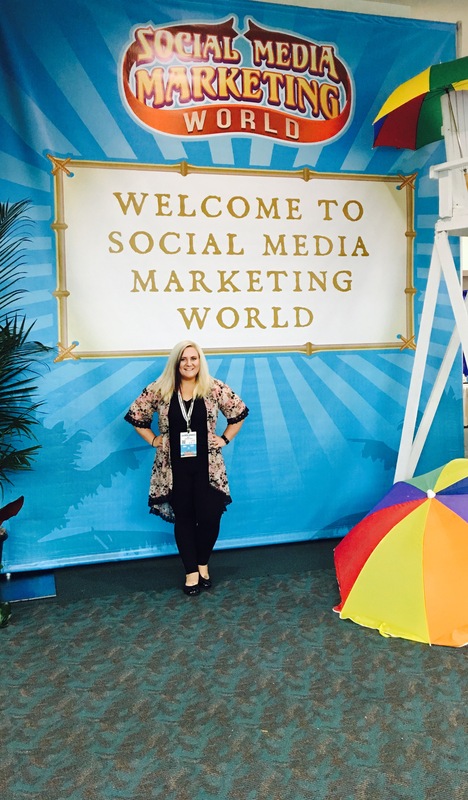 It is promoted as the largest social media marketing conference in the United States. At close to $1200 for the early bird ticket, I thought REALLY hard about the decision to attend. Not that everyone is in the same boat, but quite a few of the people attending I connected with pre-event, were being sent by their companies and have all-expenses-paid trips. But for a small business like mine from Rockford, Illinois, I wanted to make sure that this would be the conference for me and would give me an unforgettable experience. After much research I decided that it was worth taking the risk. I participated in all threads and apps provided ahead of time to meet people in similar fields as me and signed up for different events ahead of time. I read everything I could about past conferences from people with much more experience than me. Then off to San Diego I flew. I’ve now been in San Diego for just under 24 hours and I have already met connections from the conference (which hasn’t even started yet) at various networking opportunities that I hope to carry with me through out the rest of my life. I look forward to the rest of this conference and I will keep this blog updated as I go if you care to follow along!